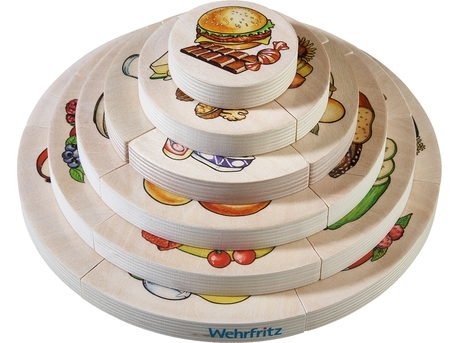 The 3D “Food Pyramid” layered puzzle raises players’ awareness of a wellbalanced diet: it consists of 22 robust wooden puzzle pieces showing wellknown foods and drinks which are put together in 6 layers. The players familiarize themselves with foods, food groups and quantity recommendations while they do the puzzle. Includes instructions with interesting information about the food groups.